I’m absolutely delighted to welcome Weina Dai Randel to Triclinium. 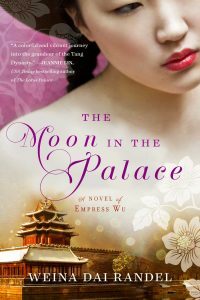 Weina’s first novel, The Moon in the Palace was nominated for Best Historical Fiction of 2016 by Goodreads Choice Awards. She is the author of two historical novels about Empress Wu, the one and only female ruler in China. The two novels will be translated into six languages. Born and raised in China, Weina came to the U.S. at the age of twenty-four. She has worked as a journalist, a magazine editor, and an adjunct professor. 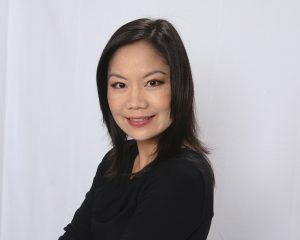 Find more about Weina on her television interview, The Wall Street Journal China blog, Library Journal, The Huffington Post, and other publications. You can connect with Weina via Facebook, Twitter or visit her website. I’ve dreamed to be an author since I was a kid, so it’s hard to say who inspired me to first write. But I can tell you many fine authors influenced me. Among them are Geradine Brooks, Arthur Golden, Mary Stewart, Anita Diamant, and Ken Follett. My current work deviates from my Empress Wu series. It was inspired by true events that happened during my childhood. I wish I could tell you more but it’s not finished yet. I am interested in many topics and themes, such as adventure stories, female friendship, strong female’s journey, family stories, and I hope to explore all of them in the future if possible. If not, then I hope I’ll just focus on women and their lives in and outside China. To me, the period of time is not as important as the historical figure or the event itself. If I find a historical figure, or an unusual event that occurred in history, that is worth noting or intrigues me, I’ll explore the time period. With that said, I’m always fascinated about the time of King Arthur in Great Britain, Tang Dynasty in China, and the era of Julius Caesar and Augustus in ancient Rome. It took me ten years to write and publish The Moon in the Palace, so you can see I did an insane amount of research. I bought many Chinese poetry, paintings, and history books in China fifteen years ago before I immigrated to the United States, so they came handy. I also purchased books on Amazon and looked for books in my local library. Usually the library wouldn’t have them, as topics regarding China and its history were not popular, so I borrowed them through Interlibrary Loan. I also visited museums whenever I could to study Asian artefacts, but I have to confess that so far I haven’t found a museum whose collections of Asian art impressed me. I want to say I just leave it and move on, but it doesn’t always happen this way – sometimes I found myself got stuck over a word and thought hard to find it or replace it, by the time for me to stop, an hour was wasted. I think next time I’ll just check Facebook instead. I can only write when I sit in front of my computer in my study. I cannot write in a cafeteria, a hotel, or a car, or use a laptop. Words feel differently to me if I leave my study and computer. I don’t use Scrivener; I use the plain, old fashioned MS word. I do sometimes write in long hand, especially when I write poetry, but most of time I write short hand. When I was writing The Moon in the Palace and The Empress of Bright Moon, I loved to study ancient Chinese landscape paintings and also paintings about domestic lives. They were inspirational and offered a comprehensive study of nature and human life different from the contemporary world. More writing, less talking about writing, maybe? And just keep writing, don’t give up. And read. Reading is very important. Tell us a little more about your The Empress of Bright Moon series. The Moon in the Palace is the first of the series. It was just nominated for Best Historical Fiction of 2016 by Goodreads Choice Awards. I feel so honored. The series are historical novels about Empress Wu, also known as Wu Zetian, the one and only female emperor in China. Many people call Empress Wu the Chinese Cleopatra for her beauty, seductiveness, intelligence, and also her unrivalled power as the only woman who ruled the country. These two novels, telling the fascinating tale of her rise to power, have received excellent reviews. I hope you’ll check them out. A concubine at the palace learns quickly that there are many ways to capture the Emperor’s attention. Many paint their faces white and style their hair attractively, hoping to lure in the One Above All with their beauty. Some present him with fantastic gifts, such as jade pendants and scrolls of calligraphy, while others rely on their knowledge of seduction to draw his interest. Young Mei knows nothing of these womanly arts, yet she will give the Emperor a gift he can never forget. 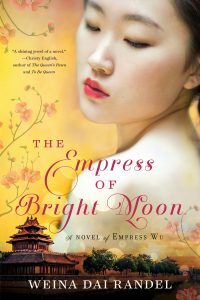 In the breakthrough first volume in the Empress of Bright Moon duology, Weina Dai Randel paints a vibrant portrait of ancient China–where love, ambition, and loyalty can spell life or death–and the woman who came to rule it all. The Moon in the Palace is available at Amazon, Kobo, Barnes and Noble and Audible. The Empress of Bright Moon is available at Amazon, Kobo, Barnes and Noble and Audible. Many thanks for joining me on Triclinium, Weina. Congrats on the Goodreads Choice Awards nomination! I also took ten years to write my first book, The Wedding Shroud, so I understand how exciting it must be to now see your novels enjoyed by so many readers. I’m just now writing. It’s taken years to sit down and do this! Ten years doesn’t sound too bad. Try twenty. Haha. Thanks for dropping by – Karen, glad you’ve finally found the time to write. I hate to say I also spent 5 years writing my first novel which is in my bottom drawer! I particularly appreciate knowing what pieces/types of art inspire writers. Nice interview. I’d love to find a new series by new author. Thanks for the chance to win the CD. Love to find a new series and new to me author. Thanks for the chance to win the CD. Great interview! These books look very interesting. Looks like a fascinating read. Thanks for helping me discover a new author! Wonderful interview and thank you for a chance at the audio book. Wonderful interview! I love learning about an author’s writing process. I have added both books to my TBR list and hope to get to them soon. Wow! Enjoyed reading this & am.looking forward to reading the books. Beautiful covers, by the way. I’ve read both of Weina Dai Randel’s books on Empress Wu and was thoroughly enchanted. I hope she continues to write such interesting and historically significant novels.